VirginiaMiddleton.ca | MMXVI – What’s on the go? Home » 2015 » MMXVI – What’s on the go? 1. Move more. For 2016, I want to not just run the Tely 10 (for the fifth time in a row), I’d like to set a personal best and I would really like to try to prepare for a half marathon that’s happening in Montreal this September. More details on that later. 2. Read more. This year I set a reading goal on Good Reads and have read 21 books when my goal was 20.
may not seem like a lot to most people, but for me who is a slow and easily distracted reader, I’m pleased with it and want to keep it up. I have a couple of books I’m tracking on Good Reads that are ebooks that are actually three or four book bundles, so they’ll make this goal more challenging (like the Game of Thrones books 1-4 as a set and I’m only through 7%), but let’s see how I do with it.I was also fortunate to receive my mom’s old Kobo Mini and I think that will help encourage me to read more. 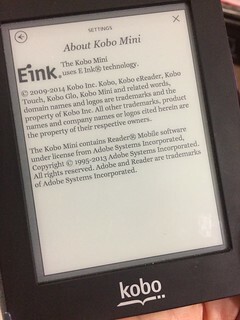 I enjoy reading on my phone, but having the little ereader will be even more convenient because my phone has limited storage and the e-ink is easier on my eyes. 3. Knit more. I have to confess that I really need to reconnect with my love of knitting. I’ve neglected my stash and I have a number of UFO (unfinished projects) that are begging to be completed (including slippers for my sister-in-law that I started last year… sorry Nicola! You’ll get them soon!). With that in mind, I want to complete 3 UFOs and knit 3 new projects that can come from my current yarn stash. 5. Learn more. In 2016, I want to explore and set up some professional development options at work. I’ve been speaking with my communications manager and the HR manager in our faculty and we’re going to talk about some different ideas and areas to focus on. One program I’ve started setting into motion is the mentoring program that’s available, which I predict will be really interesting. 6. Photo more. I love taking photos. I have a SLR camera that while it isn’t the latest and greatest product from Canon, it can take some nice photos. I also have an iPhone 5s that takes great photos as well (in fact, most of our annual photo calendar’s photos came from photos taken exclusively from my phone). I’m tempted to try to pull off a daily photo challenge. Nothing fancy, just post one photo a day that I take with my phone. 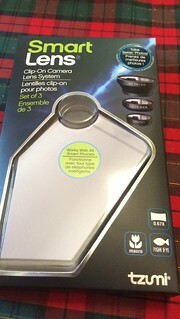 I even have some fancy new little lenses that I can attached to my phone that Matt gave me for Christmas. Months ago I started following the KonMari Method to help organize our home. 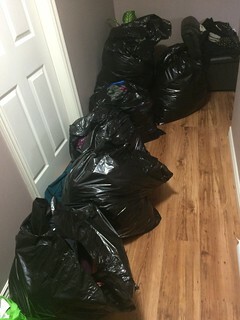 I managed to get rid of over 160 lbs of clothes, not to mention a lot of shoes and purses. But I haven’t really reorganized the clothes I still have and we haven’t really started the next category, books, yet because I’m stuck feeling like I need to have my clothes figured out. So here we go – I want to complete the KM process by Dec. 31, 2016. That 366 days and if we actually put aside some time and approach it strategically, I think it’s something we can do. 8. “No” more. I’m not very good at saying no. I’ve always been something who tries to be enthusiastic whenever trying to accomplish a task, project or outcome. But as evidence of my lack of saying no, I haven’t always been able to put myself first and say no to other people so that I could say yes to myself and do things for me. I need to make some tough decisions with my volunteer commitments and there are some other things I need to start saying no to when responding. With more nos, maybe I can accomplish the seven goals above with greater ease. This is a fairly lofty list, but with some planning and motivation, I really think it’s possible to work on all eight of these areas. What do you think? Any tips, hints or advice? Are you going to try to do more or less of something in 2016? Let me know!